The Model AS-10 Hydraulic System Trainer provides hands-on training to the students so that they could understand the function, identify components, and troubleshoot a fully functional hydraulic system. Model AS-10 is a complete standalone trainer designed such that each component can be removed, overhauled, reinstalled, and functionally tested. A simulated flight control surface is operated to demonstrate the principle of hydraulic-actuated flight controls. Supplied with CBT to enhance students’ assimilation of hydraulic systems found on modern aircraft. All components are operational, removable, and re-build able. Parts kits for these common components are available through many parts dealers. 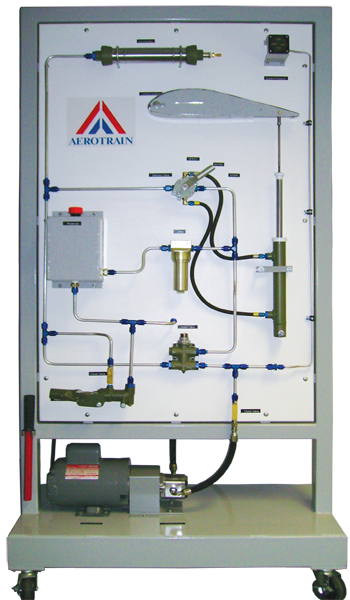 The components installed on this completely operational trainer are either new or completely disassembled, resealed, cleaned and painted or chemically treated for years of trouble-free operation. Model AS-10 demonstrates actuator sequencing. The actuator has a hydraulically sequenced double-check ball to time the main actuator with fluid pressure. Electrically switched valve may be installed as an optional item. The ergonomically-designed trainer is configured as vertical standing panel, on caster wheels with brakes. The white backboard and iron frame make this a durable, and presentable trainer. Trainer is supplied with a complete curriculum/operation manual. Both instructor and student manuals are in full color. The trainer is supplied with free CBT that covers the essential topics in hydraulic training. Aircraft hydraulic cylinder (dual acting), sequenced by a sequencing valve. Large, laminated, colored schematic poster of system plumbing.